Journey to the world’s most beautiful places in a spaciously intimate, breathlessly elegant, and all-inclusive ship. The Seven Sea Explorer offeres you the chance to experience the new standard in elegance and sophistication. 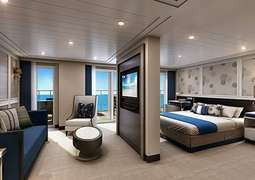 The suites on the Seven Seas Explorer range between 20m2 and 271m2, some with balconies between 8m2 and 89m2, are fitted with a walk-in closet and safe as well as every amenity you could ever desire. The mini-bar is restocked with high quality beverages daily. There are several luxury dining options onboard the Explorer. The Chartreuse offers elegant modern French cuisine, Pacific Rim has delights from Asia, there's the classic steak restaurant Prime 7 and the Pool Grill for something between meals. There is also the chance to get coffee or a snack at several of the bars or lounges. In the Constellation Theatre, you can expect phenomenal shows such as musicals, cabaret, artistic performances. Then afterwards relax in the Explorer Lounge where you can have a drink or listen to resident musicians entertain with familiar tunes and requests. You can also meet fellow travellers while soaking up incredible ocean views from the Observation Lounge. If you would like to improve your culinary skills, why not attend a class at the Culinary Arts Kitchen? The ship’s library is an inviting place where you can read a book in a quiet, relaxed atmosphere, play a game of chess or rent a DVD. If you want to try your luck, head down to the casino for a game or two. The pool deck features a lavish infinity pool, two whirlpools and comfortable sun loungers. Adjacent to the pool you can also join fellow guests for a cocktail or frozen drink in the relaxed atmosphere of the Pool Bar. There is also a service available for those wanting to get some information about places visited during onshore excursions. If you want to be pampered on board even further, visit the Canyon Ranch Spa Club where you are offered exclusive, high-quality treatments by trained staff. To keep in shape, visit the gym or sign up for a personal trainer. In addition, there is a jogging track, golf cages and putting greens, a deck shuffleboard, paddle tennis and a Bocce court. There is an exceptional butler service available for those in the following suite categories: Penthouse, Navigator, Grand and Master Suite. 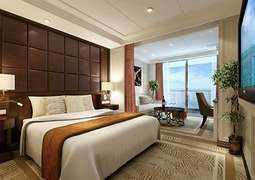 For the ultimate luxury experience, the Regent Suite features a two-person private in-suite spa, and has 270 degree ocean views. During the daytime it is permissible to wear casual attire however in the evenings and during mealtimes it is recommended to wear more formal clothing. We recommend men wear a suit and women wear an evening dress.